Home Who are we? 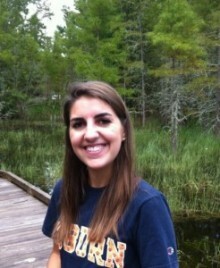 Lab Alumni (grad students/postdocs) Miranda L. Scalabrino, Ph.D. Laboratory of Greg Field, Ph.D.
Miranda White graduated from Auburn University with a B.S. in Microbial, Molecular, and Cell Biology. During her time in the Boye lab, she focused on targeting gene therapy vectors specifically to bipolar cells in several models of inherited retinal disease. ML White, SL Boye, FM Dyka, S Min, Q Ruan, KM Fransen, CN de Leeuw, EM Simpson, MA. McCall, NS Peachey, SE Boye. “Optimization of rAAV to target ON bipolar cells and to rescue the nobnyx mouse, an animal model of X-linked Congenital Stationary Night Blindness.” American Society of Gene and Cell Therapy Annual Conference, New Orleans, LA, May 2015. ML While. University of Florida Interdisciplinary Program in Biomedical Sciences Seminar, Gainesville, FL. AAV-mediated rescue of a mouse model of X-linked Congenital Stationary Night Blindness. January 2015. White ML , Dyka FM, de Leeuw CN, Min S, Ruan Q, Boye SL, Hauswirth WW, Peachey NS, Simpson EM, and Boye SE. Optimizing rAAV vectors to target ON bipolar cells. [Invited Data Blitz Presentation & Poster] FASEB Neurobiology and Visual Processing, Saxtons River, VT, June 2014. Choudhury S, Manek R, White M, Sun J, Aslanidi G, Svrivistava A, Boye SL, Boye SE. Rational Design of AAV Vectors For Efficient Transduction of Müller Cells. Association of Research in Vision and Ophthalmology Annual Conference, Denver, CO, May 2015. White ML, Dyka FM, de Leeuw CN, Min S, Ruan Q, Boye SL, Hauswirth WW, Peachey NS, Simpson EM, and Boye SE. Optimizing rAAV vectors to target ON bipolar cells. Association of Research in Vision and Ophthalmology Annual Conference, Orlando, FL, May 2014. Boye SL, White M, Bennett A ,VanVliet K, Dinculescu A, Min S, Peterson J, Agbandje-McKenna M, and Boye SE. Heparan sulfate affinity dictates transduction of photoreceptors from the vitreous by capsid mutated AAV2 variant. Association of Research in Vision and Ophthalmology Annual Conference, Orlando, FL, May 2014. White ML, Dyka FM, de Leeuw CN, Min S, Ruan Q, Boye SL, Hauswirth WW, Peachey NS, Simpson EM, and Boye SE. Optimizing rAAV vectors to target ON bipolar cells.University of Florida College of Medicine Celebration of Research, Gainesville, FL, March 2014. Groover C, White M, Loprete DM, Hill TW, Jackson-Hayes LM. Promoter replacement of genes regulating cytokinesis in the filamentous fungus Aspergillus nidulans. Rhodes College Undergraduate Research and Creative Activity Symposium, Memphis, TN, April 2010. White, M, Shang K, Hill TW. Rhodes College Undergraduate Research and Creative Activity Symposium, Memphis, TN, April 2009.